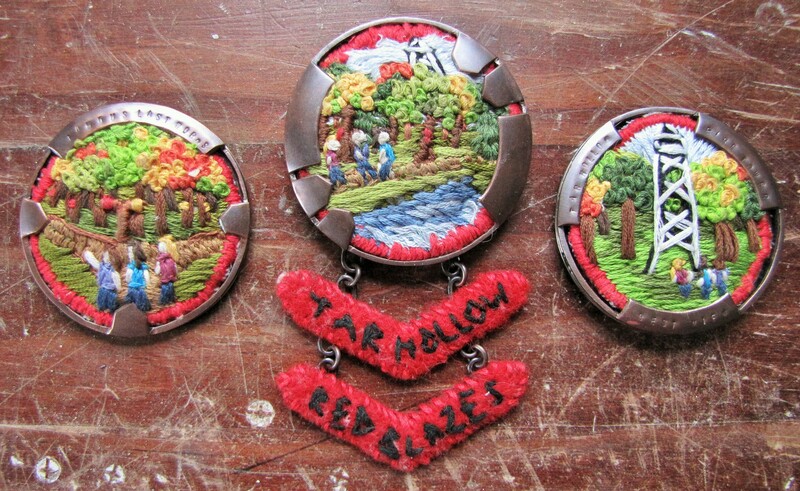 The project: Make a brooch to commemorate an event in my life. Make the back as interesting as the front. I made three. Because sometimes I’m an over-achiever when it comes to my art classes. And because with more than one I could tell more of the story. The story, as far as I remember it, started with my two friends and I looking for Conkle’s Hollow in Hocking Hills, Ohio. We drove past it and, in the spirit of adventure, decided to keep going and see what we could find. We found Tar Hollow. More precisely, we found the back parking lot and a trail head leading off into the woods. And, in the spirit of adventure, we took off along the trail to see where it would lead. It led into a beautiful patch of woods, around some ponds, and farther on into the woods. We found the Blue Blazes trail, part state wide Buckeye trail, scenic vistas, logs to climb over, strange bugs and secluded, narrow paths. After an hour we found fork in the path and a sign proclaiming the Red Blazes Loop. We took stock of the time (early afternoon), our supplies (three granola bars, a camelbak bladder and a bottle of water) and debated if we could continue on or turn back. Someone made a great observation that: A. None of us had heard of this park in our many years of coming to Hocking Hills so it couldn’t be all that large. B. A sign noted that it was a boy scout maintained trail and therefore couldn’t be overly long. And C. It was a loop, so it would take us back to where we started, therefore there was no fear of getting lost. (I will neither confirm nor deny that I said either A or B.) So, after these great skills of persuasion, we took off on the Red Blazes Loop. And that became the brooch on the left in the series, complete with ill-advised quote on the back. We found more glorious vistas, meadows, woods, sunlight. And were quite pleased with ourselves for the next couple hours. Then after a couple more hours and a bottle of water and a granola bar were consumed, we found the next fantastic site: a Fire Tower. And of course, being impromptu adventurers, we climbed the fire tower. There was a vague hope that we might see some identifiable location like the parking lot with our car or the visitor’s center. But instead we were treated to a grand view of the forest at large. It was awesome. And endless. 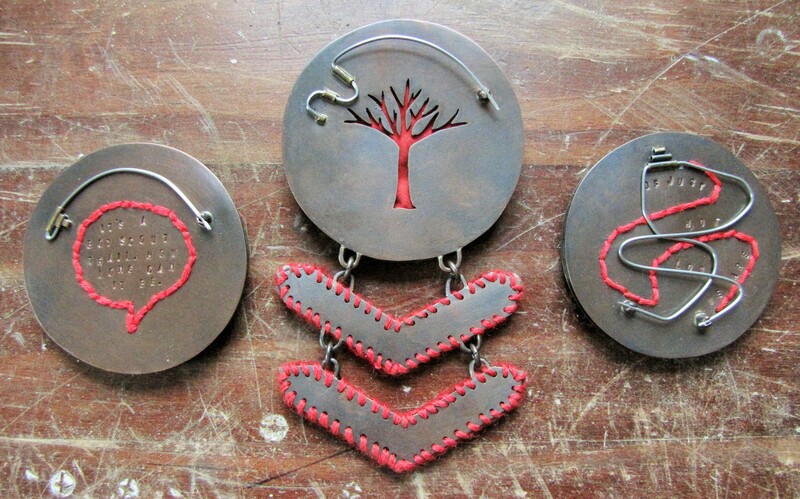 This was the idea for the brooch on the right. After continuing our journey for another couple hours we ran into the other people we had seen all day. They looked like they came here often, wearing long pants and longs sleeves despite the warm weather (probably to fend off the nettles) and carrying bags that probably had enough food and water to last them the day. More importantly, they had a map. And the knowledge that further ahead the nettles were nearly impassable (a problem since one of us who may or may not have been me, was wearing capris.) They graciously let us use their map and we did our best to find a short cut back. If we didn’t find a faster route than the one we had taken for the last several hours, it would have been dark well before we got back to our car. We decided on the access road that went by the fire tower. If I did a fourth brooch in the series it would be of the three of us riding in the back of a red pick-up truck driven by a young guy with a Taz the Tasmanian devil tattoo on the back of his shoulder and classical music coming out of his radio. Thanks to him we managed to get to the visitor’s center (where apparently all the people were). And then, after a hike around a large pond we got back to the car and made a feast out of all the lunch meat and snacks in the cooler and drank a lot of water. But I’ll have to work on those later because it’s already time for project three in my metals class: Shell forming! I’m excited to fully shape metal to the curving forms of my whim! I’m thinking lotuses…. Time to make some paper models!